The Campeche chair, a leather or caned sling seat supported by a non-folding cross-frame, was in widespread use in the United States and New Spain in the first half of the nineteenth century. The Campeche, also called a “Spanish chair” or boutaque, is a leather or caned sling seat supported by a non-folding cross-frame. It had widespread use in the United States and New Spain in the first half of the nineteenth century. The name “Campeche” (or “Campeachy,” a term used by Thomas Jefferson to describe the form) is taken from the Yucatán port city in Mexico, or Bay of Campeche, from which such chairs were shipped to Louisiana. Early nineteenth-century New Orleans cargo manifests title them boutaque, from the Spanish word butaca (armchair). Usually made of mahogany, these chairs are sometimes incorrectly described as being made of Campeche wood or logwood (also bloodwood or palo de tiente), which was imported regularly from the Yucatán to North America for use as a natural dye. Although it originated in Europe as a variant of the Roman sella curulis (magistrate’s seat), the Hispanic butaca and the joinery methods used in its construction were transferred to the Americas during the Spanish conquest. Reminiscent of indigenous X-frames, the butaca functioned as an acceptable hybrid in the blended society of New Spain, marrying the European design with an innovative reclining back that was practical in tropical plantation culture. Planter’s chairs are a related variant, with arms that fold out for footrests. In North America, Campeches had an exotic flair, compared to Anglo-American furniture. But in New Orleans, where these chairs were regularly shipped from the Yucatán (probably from the Spanish colonial period onward), they were a normal part of the cultural landscape, reflecting the Latin heritage of many local residents. In January 1818, shortly after his arrival in New Orleans, Benjamin Henry Boneval Latrobe (1764–1820) painted a French Quarter rooftop scene overlooking ships docked along the Mississippi River; both the cigar and the Campeche chair of the gentleman seated at center easily might have been imported by one of the pictured vessels. Thomas Jefferson received his Campeche as a gift from Thomas Bolling Robertson, the first US representative from Louisiana, who later served as the state’s attorney general and governor. 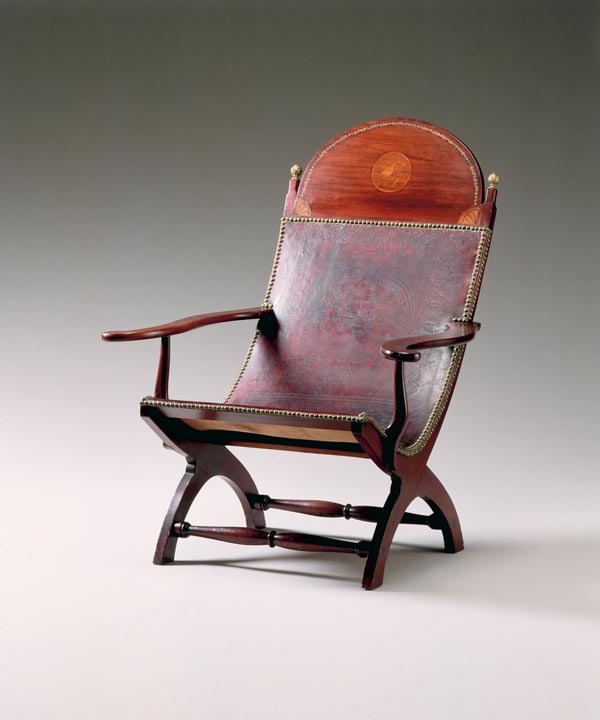 Jefferson found the Campeche so comfortable that he had at least one replicated at the Monticello joinery. Demand for the chairs spread: Campeches appeared in an 1828 Philadelphia cabinetmaker’s trade catalogue and in an 1844 London chair maker’s price book, which copied the popular imports from Spain and Latin America. 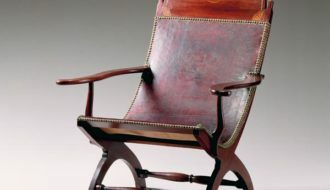 Today, Campeches remain in museum and university collections, including the Louisiana State Museum, Princeton University, and The Metropolitan Museum of Art, where New Orleans merchant James Colles’s intricately inlaid and embossed leather chair is on permanent display in the Henry R. Luce Center. Although the Campeche was pervasive in North America and elsewhere, the chair remains strongly associated with Mexican culture. In the twentieth century Cuban-born designer Clara Porset (1895–1981) celebrated the form as a symbol of Mexican folk tradition, and her designs were shown at the Museum of Modern Art in New York. Former Tulane University architecture professor William Spratling (1900–1967)—well known for his “Spratling y Artesanos” silver designs made in Taxco, Mexico—also produced a line of butaquitos (diminutive armchairs). Gontar, Cybele "The Campeche Chair." In https://64parishes.org Encyclopedia of Louisiana, edited by David Johnson. Louisiana Endowment for the Humanities, 2010–. Article published December 11, 2013. https://64parishes.org/entry/the-campeche-chair. Gontar, Cybele. “The American Campeche Chair.” The Magazine Antiques 175, no. 5 (May 2009): 88–95. ———. “The Campeche Chair in Louisiana.” In Furnishing Louisiana: Creole and Federal Furniture, 1735–1835, by Jack D. Holden, H. Parrott Bacot, and Cybèle T. Gontar, with Brian J. Costello and Francis J. Puig, 330–61. New Orleans: The Historic New Orleans Collection, 2010. ———. “The Campeche Chair in the Metropolitan Museum of Art.” Metropolitan Museum Journal 38 (2003): 183–212. ———. “Spanish Chairs in the New Republic.” The Magazine Antiques 177, no. 4 (Summer 2010): 78–82.